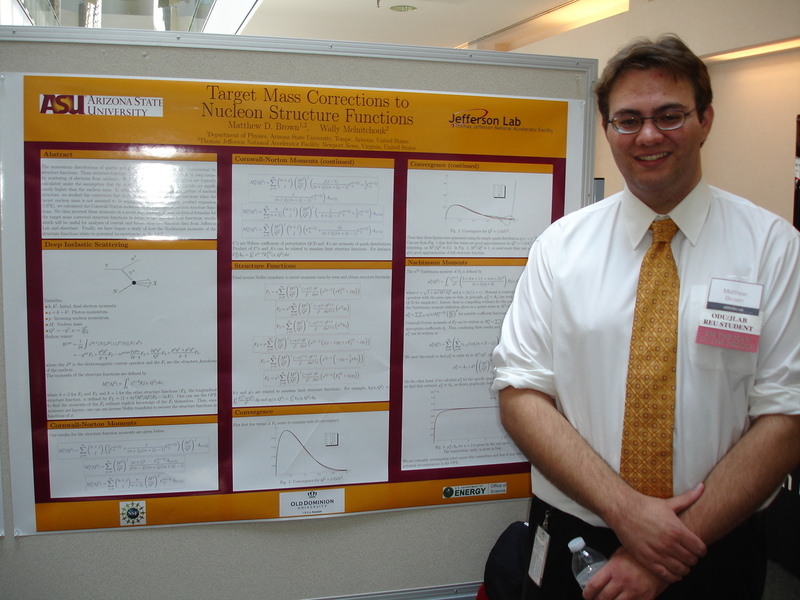 Matthew Brown, an Arizona State University physics and math major, has won the 2013-2014 Goldwater Scholarship. “I am very honored to have received the scholarship,” Brown, a senior, said, adding that after he achieves a bachelor’s degree next year, he intends to pursue a graduate degree and work in academe. Brown’s goal is to complete a doctorate in mathematical physics and conduct research in theoretical and mathematical physics at a research institution. “I hope the prestige of the Goldwater scholarship will help me achieve these goals,” he said. Brown was selected from a field of 1,107 mathematics, science and engineering students who were nominated by the faculties of colleges and universities nationwide. The Goldwater Foundation awarded 271 scholarships for the 2013-2014 academic year to undergraduate sophomores and juniors from throughout the United States. The Goldwater Foundation is a federally endowed agency established in 1986. The scholarship program honors Sen. Barry Goldwater – a businessman and five-term U.S. senator from Arizona, and the Republican Party’s presidential nominee in 1964 – and was designed to foster and encourage outstanding students to pursue careers in the fields of mathematics, the natural sciences and engineering. The Goldwater Scholarship is the premier undergraduate award of its type in these fields. 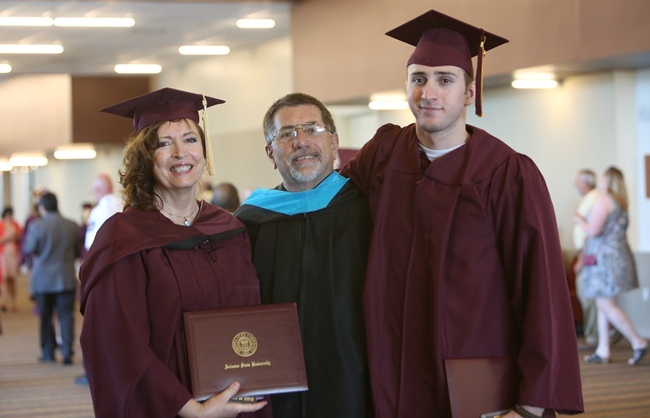 In addition to Brown, another ASU student received recognition for his academic prowess. Chris Murray, a senior majoring in molecular and cellular biology and a student in Barrett, The Honors College at ASU, received Honorable Mention from the Goldwater Foundation. Murray plans to complete a doctorate focusing on the molecular and genetic basis of cancer. His goal is to conduct cancer research and administer his own university-affiliated research institution. Dan Zorich couldn't get a better seat at the College of Public Programs spring 2013 convocation, where his wife and son were graduating. Dan Zorich couldn't get a better seat at the College of Public Programs spring 2013 convocation, where his wife and son were graduating. As assistant director of online education for the School of Criminology and Criminal Justice, he sat onstage with other college administrators and faculty. And when it came time for his wife, Antoinette, to receive her Master of Social Work degree and his son, Chaz, to receive his Bachelor of Science degree in Criminology and Criminal Justice, Zorich was allowed to hand both their degrees. Zorich has taught at the school since receiving his Master of Public Administration degree from the college in 1999. He oversees ASU's second largest online program. The former Vietnam veteran has more than 30 years experience in corrections. He worked at a maximum security prison in Illinois, serving as clinical director for the Pontiac Correctional Facility southwest of Chicago, and was a probation supervisor for Maricopa County. His wife had a successful career as a Maricopa County probation officer for more than two decades. But she didn't want to study criminology. Instead, she enrolled in the School of Social Work in the College of Public Programs. Once she receives her state license, Antoinette wants to work with veterans or children with early childhood development issues. "I never envisioned my wife going to school after retiring as a probation officer of 22 years," Zorich said. "But she really wanted to go back and pursue a graduate degree." Zorich said part of her motivation came from seeing Chaz enroll at ASU. A military MP, he took online classes while serving in the Arizona National Guard, but finished his degree in person, and would often commute with his father to school. Now that he's earned his degree, the younger Zorich is exploring career options, which include working in law enforcement or going back to graduate school.